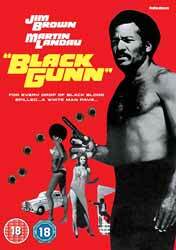 Black Gunn (1972. 1 hr, 36 min, 41 sec) is a neo noir blaxploitation movie, directed by Robert Hartford-Davis from a Robert Shearer screenplay. Blaxploitation is a sub-genre of film which came to prominence in the nineteen seventies. Aimed at a black, urban audience the films soon started to cross boundaries with some like Shaft (1971) spawning later remakes. I’m guessing that the film reflects, on some level, the experiences of black people, although a liberal white audience may find some of the language, especially the easy racism uncomfortable to watch with the liberal use of the ‘N’ word in the mouths of white mobsters and cops. Gunn is played by Jim Brown an NFL football player who transitioned into a successful acting career (The Running Man (1987), Mars Attacks (1996)). Although not the best actor in the world he does bring a physicality to his role. There is enough violence to keep things going, at the same time Gunn makes time for the ladies when he is not giving it to the man. It’s a paint by numbers script but delivered with enough gusto to make the film enjoyable. There are some notable actors which appear with Herb Jefferson Jr and Martin Landau appearing alongside Bruce Glover, who turns in the most memorable performance as a psychotic mob enforcer. He is probably better known for his role as Mr Wint in Diamonds are Forever (1971). The movie is presented in its original 1.85.1 anamorphic aspect ratio. The film has not been restored and has print grain. There is an English DD mono audio mix which is clear, if not particularly dynamic. The film offers little that has not been seen in other films, but overall is an enjoyable slice of B Movie nonsense. The DVD contained no extras.